Arenas Malaga - Getting from Malaga airport to Arenas. 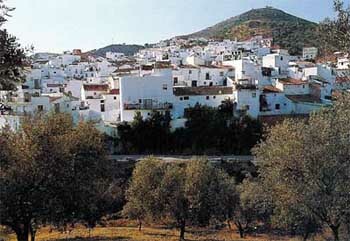 Arenas is a small municipality in Malaga province, situated in between the Axarquia mountains at about 12 km away from Velez-Malaga and approximately 50 km away from Malaga, very near the mountain ranges of Tejeda and Almijara. Arenas is a natural paradise with Moorish origins where the olive tree and the grapevine have been their main cultivations throughout history and still represent an important element in its economy. Arenas originated in Al-Andalus, during the period of the Granada Kingdom, and was a small rural community until the 16th century, when after the conquer of the Christian army all of the inhabitants were expelled and replaced by families from all over the peninsula, although mainly from Jaen (that had previously come down from the north of Spain). From the moment of the Reconquista, the Christian culture was developed in the municipality, with its inhabitants working mainly in farming, which is still the main work nowadays. In the urban core of Arenas we’ll find the Concepcion church with its Mudejar (Moorish) style, and right next to it is the old 13th century minaret of Daimalos, one of the oldest in Spain that had resisted both the Christian invasion as well as the passage of time. Strolling through Arena we’ll enjoy its narrow and white streets, decorated with plant pots and jasmines, the old quarter is the most beautiful architectural work in Arenas with 3 very characteristic districts, the high district where the village’s craftsmen used to live, the town centre where the upper class lived and where the town hall square is located as well as the 12th century church-mosque, and the low district, home of the poorer families and working class back in the olden days. From any point we can spot the fortress situated on the hill next to Arenas. Its well worth a visit to the ruins of the Bentomiz Castle, an Arab fortress with amazing views over the Costa del Sol and the Axarquia region, and that was conquered in 1487. There are not very many remains left and it’s still not restored. At some point in the past it was an Iberian hamlet where both Phoenician and Greeks built factories, passing through Carthaginians and then later on the Romans, of who we’ll find the remains of some baths. The fortress was reconstructed by the Arabs, and they finally handed it over peacefully after being defeated towards the end of the 15th century. Official website: Ayuntamiento de Arenas. To get to Arenas, we have to head towards Velez-Malaga; our destination is situated 60 km away from Malaga airport (about 55 min. by car). We recommend checking out our prices if you wish to hire a car in Malaga or see the Google map below to learn the route from Malaga to Arenas.